One-piece stamped basin with low-profile design with 100% lead-free waterways. 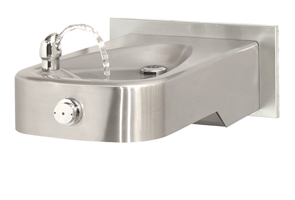 This wall mounted drinking fountain can be placed securely in many locations without taking up too much space. Bubbler head, push button, waste strainer, and trap are antimicrobially treated using the natural protection of silver which helps protect it against the growth of mold and mildew on treated components. Finish the look with a decorative satin stainless steel back panel to help protect the wall from accidental splashes. Barrier-Free (Universal Access), Satin Finish Stainless Steel with Round Sculpted Bowl. 14 gauge Type 304 Stainless Steel Satin Finish Basin with Optional Integral Mounting Plate. 14 gauge Type 304 15" x 9" Stainless Steel Optional Back Panel. Polished Chrome-Plated Brass Vandal-Resistant Bubbler Head with Integral Laminar Anti-Squirt Flow. Chrome-Plated Brass Vandal-Resistant Waste Strainer. Model 1107L Series meets current Federal Regulations for the disabled including those in the Americans with Disabilities Act. 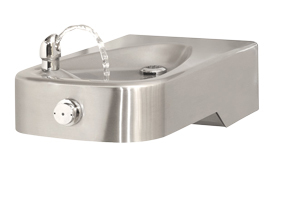 Haws manufactures drinking fountains, electric water coolers and electric drinking fountains to be lead-free by all known definitions including ANSI/NSF Standard 61, Section 9, California Proposition 65 and the Federal Safe Drinking Water Act.